Promotional logo kids classic sunglasses are stylish and offer UV400 protection, which makes it a great hit with kids. 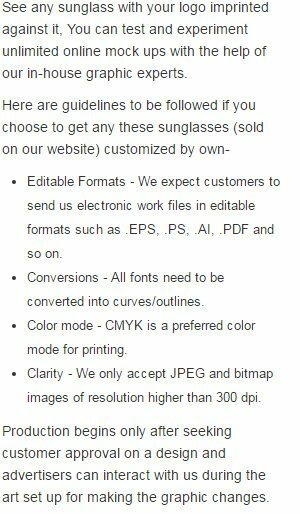 These customized sunglasses can be availed in various solid colors and marketers can save on bulk ordering them from us. It can be offered as an individual gift or as a complement or as a tote bag insert during tradeshows, business conferences, school events, society functions and more. You can save on ground shipping, which is offered FREE around contiguous USA. Request a quote to know discounts that you can avail on bulk orders of these personalized logo kids classic sunglasses. When ordering blank items of this product either exactly 1 or atleast '+72+' must be ordered!